This week’s mystery movie has been the 1935 MGM picture “Kind Lady,” starring Aline MacMahon, Basil Rathbone, Mary Carlisle, Frank Albertson, Dudley Digges, Doris Lloyd, Nola Luxford, Murray Kinnell, Eily Malyon, Justine Chase, Barbara Shields, Donald Meek and Frank Reigher. It was directed by George B. Seitz. The script was by Bernard Schubert, adapted from a successful play by Edward Chodorov, based on a story, “The Silver Mask,” by Hugh Walpole. The remarkable photography was by George Folsey. The film opens with Christmas music and you might be expecting a holiday tale – but you would be terribly wrong. “Kind Lady” is suspense-thriller about what happens when woman’s charity is misplaced. Judging by the clips in the Los Angeles Times and New York Times, the film was eclipsed by the Broadway play, which ran for 82 performances in 1935 and was revived for 107 performances in 1940. “Kind Lady” was remade in 1951 with Ethel Barrymore and Maurice Evans. Doris Lloyd is in both versions, but in different roles. As far as I can determine, “Kind Lady” is not currently available on DVD and was not released on VHS. Update: This is Nola Luxford. This is rather mysterious Justine Chase in what was apparently her only film appearance. She was also in the Broadway version. Here are two frames of a mystery fellow. It’s hard to get a sharp image of him because it’s a tracking shot and the individual frames are a bit murky. Update: I added our friend because I thought some of our silent movie fans would recognize him. This is James “Jimmy” Aubrey. And here’s a sharper image of another mystery fellow. Update: This is Charles Coleman. For Thursday, we have a mystery woman and mystery baby…. Update: This is Eily Malyon. And two more mysterious women…. Update: This is Doris Lloyd. Brain Trust roll call: Howard Mandelbaum (mystery movie and Wednesday’s mystery guests), Gary Martin (Wednesday’s mystery doorman), Mike Hawks (Wednesday’s mystery doorman) and Don Danard (Wednesday’s mystery doorman). Update: And our stars, Aline MacMahon as the kindly woman and Basil Rathbone as a coldblooded, scheming villain. Brain Trust roll call: Anne Papineau (mystery woman with baby), Mike Hawks (mystery movie and Thursday’s mystery women), Jenny M (mystery woman with baby), Howard Mandelbaum (Thursday’s mystery women, mystery baby), Sheila (mystery movie, Thursday’s mystery women), Chrisbo (mystery woman with baby) and Don Danard (mystery woman with baby). Taking a wild stab while ignoring the blonde hair: Fay Bainter. Tuesday. Barbara Stanwyck….Witness To Murder. Tues looks a bit like Barbara Stanwyck but it’s only Tues so there’s no way it possibly could be her! Tho as many films as she made, if it were Babs, it would take me until Friday (at least) to narrow down what film it might be! You’re right. I would never run Barbara Stanwyck on a Tuesday. Barbara Stanwyck takes a little snooze. Stanwyckian. Will stay tuned for the real answer. I am having more trouble with your look-a-likes than I had with your back of the head series. Last weeks we had obscure character actors resembling Dana Andrews, Broderick Crawford and Harry Morgan and the week the First Lady of Noir. Well, at least I know who Charles Coleman is. Another guess for Tuesday, Valerie Hobson. The Doorman..I think he’s a doorman .. is Charles Coleman. Guessing that Wednesday’s first mystery gent is Arthur Shields. My guess too. So, how about jumping to his brother? Barry Fitzgerald? Looks like Eily Malyon on Thursday. It could only be Mildred Natwick and Beulah Bondi. Eily Malyon; Elspeth Dudgeon; Doris Lloyd (also in the 1951 version). the woman with the mystery baby is Eily Malyon, but I can’t get any farther than that. Eily Malyon and Doris Lloyd appear and hopefully in KIND LADY. 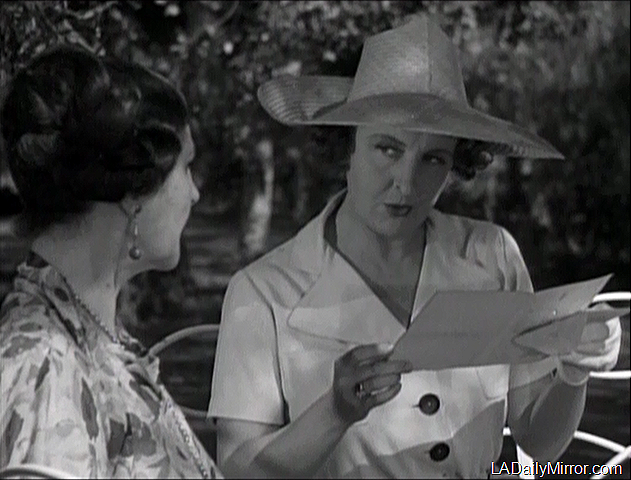 One credit Aggie Shields is Eily Malyon’s babe in arms. Kind Lady, 1935. Doris Lloyd tipped me off, finally. Is the Mystery Woman holding the Mystery Baby Eily Malyon? Aline McMahon and Basil Rathbone. KIND LADY. Nola dolberg Monday, Jimmy Aubrey, Charles Coleman Wednesday, Eily Malyon and Doris Lloyd Thursday. This would be the 1935 version of Kind Lady. I was not going to name the now obvious cast but I cannot resist typing the name of Monday’s guest, Nola Luxford later Dolberg. I can also add that in the early 1960’s I had the excitement of sitting next to Ailine Mac Mahan at an off Broadway play starring her friend Marian Seldes. For what it’s worth, Ms MacM slipped her shoes off during the performance. Aline MacMahon and Basil Rathbone in Kind Lady. Aline MacMahon and Basil Rathbone discuss important matters. So who is the crabby guy with the fire behind him?